If there’s one word that I hear come out of every one of my clients’ mouths it’s the word should. It’s not just about food and health, either. It seems to permeate all aspect of our lives. My inner-perfectionist loves the word should, a word that we somehow imagine will move us forward and finally get us to that door we long to enter. As if it’s the driving force that will help you plan your day and inspire you to be more productive, make better food choices and show up as your best self in all ways. 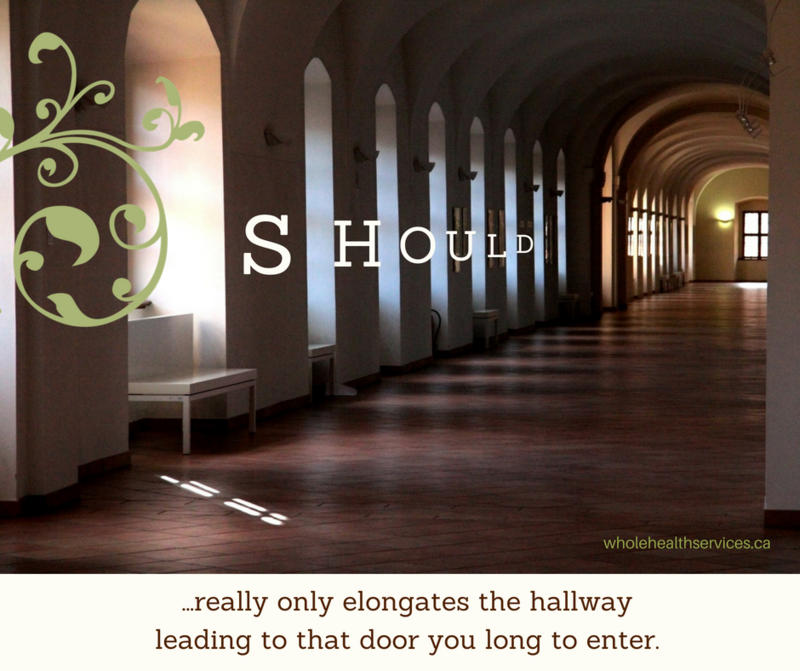 In reality, all “should” does is elongate the hallway leading to that door, like in some weird dream where you can never reach the place you’re desperate to attain. All it really does is set you up for a sense of failure because the bar – that you set too high in the first place – is now completely out of reach, no matter how hard or try… so why bother. You make it your responsibility to, not only look after everything and everyone, but do it gracefully, with perfectly coiffed hair, rock-hard abs and fuelled with nothing more than kale smoothies and rainbows. As my spiritual psychotherapy teacher often said, “we carry our responsibility on our should-ers”. “Should” weighs heavily on you, it drags you down, makes it awfully hard to rise up to life’s challenges. No wonder you’re so exhausted all the time! “Should” has become the new source of all that ails you in your life. It’s the source of all your troubles in the way that gluten was tagged, about a decade ago, when it showed up as the nutrition buzz-word. Women come to me with questions like, “should I give up gluten, should I give up dairy, should I give up red meat,…?” While it is a matter of personal exploration and reading of symptoms to decide which course of nutritional advice is right for you, the first thing that all women must to give up, across the board, is “should”. I’ve recently started to catch myself: “should” comes out of my mouth far more than I’d like to admit. Curbing it feels a bit like trying to give up gluten. It was hard to say goodbye to some of my favourite food – fresh baguette and croissant, pasta, French toast. With gradual shifts and letting new habits take root, my body slowly adjusted and I felt the difference. I noticed where the gluten had been doing the most damage. “Should” comes out when I recognise that I’ve been “bad” and know it’s time to reign in and be “good” again. Foodwise, it usually that means that the sweets have snuck back into the daily for me and I need to get out of the jag…cut the addictive streak. “Should” is the voice of the advice I’ve received over the years, when I find myself stuck in the same place for the 47th time. 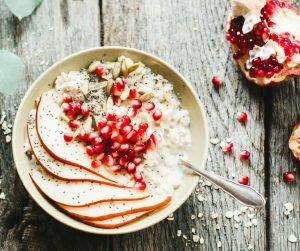 When I kept having gallbladder attacks over and over again, and my acupressurist reminded me at every session to eat less butter and more bitter, I nodded then promptly ignored her advice until it got so painful, I had no choice. “Should” surfaces when I feel guilty for not being the perfect example of business owner or housekeeper or parent or wife. The perfection, of course, defined by what I see others achieving on social media. “Should” is a word that comes from the outside. When you look up your symptoms online or go through the latest book, there may be suggestions that work for you and there may be others that don’t. Not everyone can function as a vegan or Paleo or low-fat or on whatever diet/lifestyle is being sold as the best this month. “Should” is all the expectations we set for ourselves based on the standards that have been set for us by society and the media. I’m paraphrasing my friend Casey Erin Wood here – that’s basically her definition of “perfection paralysis”. Paralysis. Should doesn’t move you forward. It stops you in your tracks. The best way to give up should? Say Yes! There is no one-size fits all solution to eating right. The truth for you may lie somewhere in the middle of several rules. You need to experiment, explore, try out and listen to what works. Yes opens the door to possibility. In the dance of emotion, Yes is linked to desire, the drive to step towards something new. You get to Yes one step at a time. This solution is not a quick and easy fix. Like giving up gluten (or sugar, or dairy, or avoiding your taxes, or…) there will be trial and error. There will be days when you can do it, and days when you want to give it all up and dive into the fresh aroma wafting from the nearest bakery. Slowly, gradually, with baby steps and support, you move away from the perfection required by “should” and come home to the comfort of being good to your body. Yes! Want help taking that action? Through the spring, I’ve been going Live to talk about some baby steps – pick one that appeals to you and give it a whirl. 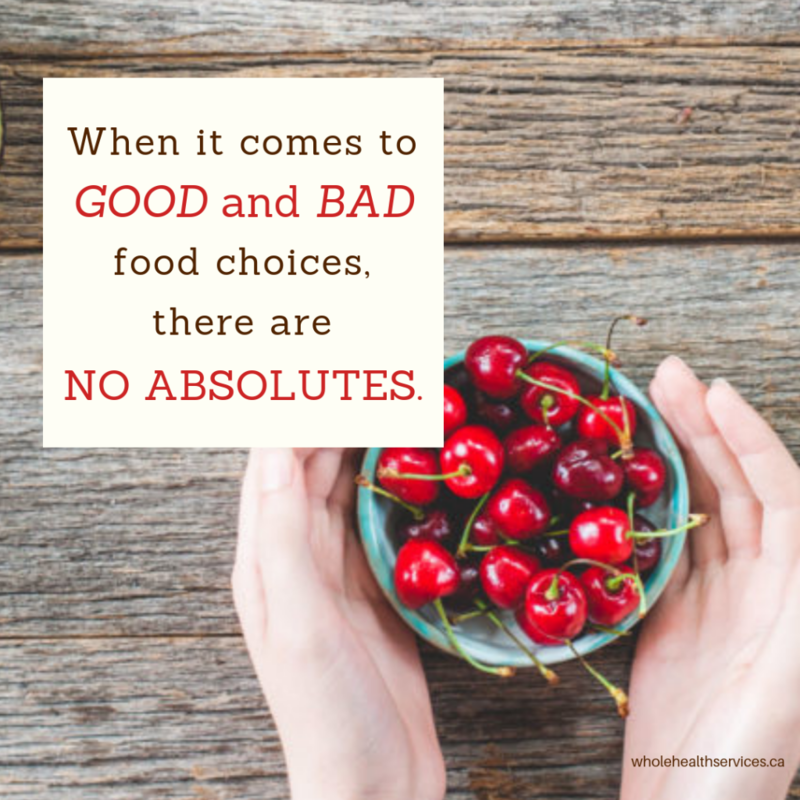 You can find support for these types of changes in The Eating Better Conversation, a closed Facebook group where we talk about the challenges that hold us back and celebrate the little wins that move us forward in our quest to eating better. Where do you should on yourself? How do you define your “Yes!”? When you share your thoughts in the comments, you open the possibilities for others. Oh, and you should really click the pretty green buttons and share this post to all your friends, telling them they should read it too! My neighbour and I had been trying for weeks to get together. With opposite work schedules and kids’ stuff, it was getting ridiculous. Last week, she noticed that the movie we’d been attempting to see in the theatre was available on demand, so she suggested a daytime date. Perfect. We found an afternoon that suited us both. “Any guilty pleasures foodwise?” she texted. “We should treat ourselves to a fun lunch while we watch!” Which translates as junk food: anything greasy, salty or sweet. I loved the idea – a yummy lunch AND a movie while our kids are at school! So as not to fall completely into eating junk, I picked up some local cheddar and fresh sourdough, made upscale grilled cheeses with a fennel salad, sweet potato fries and a delectable ginger cake. It was a fantastic meal that fit the junk food bill without going so far overboard that I’d regret it later. We indeed had a fun lunch. Up until then, the day had been pleasurable. I was gob-smacked to notice that those words from a 9-year-old brought on the guilt. 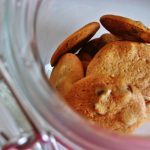 For the briefest of moments, I was frozen with my hand in the cookie jar. Guilt comes from doing something we feel we shouldn’t do. It’s about stuff we’re afraid to admit we do, like, want. The guilt that day came from the feeling that I’d been breaking the rules. As a mother I work damn hard to uphold the rules. In terms of eating, that might mean ensuring that meals happen at the table and with a good dose of vegetables. I’m also known to harp on to anyone who’s not present to their food, by reading or checking email during breakfast. There’s an assumption – a self-induced theory to the structure of my days – that while others are busy at the office or school, I too am working. Whether it’s paid work or volunteer or getting Christmas planned doesn’t matter, so long as it’s work. Something useful and productive. As a result, I seem to have created compartments in my mind for when one is expected to be serious and when one is allowed to have fun. Choosing to watch a movie over lunch in the middle of a random Wednesday afternoon broke that rule…even if the naughtiness of it was a part of the pleasure. The guilt – the shame – came in the being found out, like a teenager who sees the only thing wrong with her behaviour is getting caught. Was it in the 90s when people started spouting that “guilt is a useless emotion”? I remember my mother-ex-in-law explaining it to me; how, like worry, it doesn’t have any function other than to tie you in internal knots. Perhaps, like worry, guilt’s function is to point us in the direction of that which needs to change, where we need to set something in motion outside of ourselves. This particular afternoon of hookie brought my awareness to how much I strive to, if not always follow the rules, at least give the impression that I am. This is my inner teenager, who learned how to rebel without getting caught…and perhaps, without willing to go too far out of her comfort zone. My predilection for rules got me labeled as the goody-goody more often than I care to admit. This week’s taste of guilty pleasure reminded me that I can follow the rules and be productive and useful, but I don’t need to take it all so seriously. I’m not going to be struck from above for having a bit of fun. Yes, it’s important that I stick to a certain structure for the sake of my business and my family. It’s important that I take proper care of myself, to feed myself nourishing food and avoid the things that cause me harm, but it doesn’t need to be serious. Those 2 attitudes don’t need to walk constantly hand-in-hand. In this case, it means that a “fun” meal can also have elements of healthy – that a healthy lunch can be fun. The pleasure of food comes from the delicious combination of colours, textures, flavours,… without going overboard into the realm of punishment. Within that pleasure, letting loose into “cheating” or being “naughty” means making choices that veer from my daily regime, and for the most part, they happen consciously. While this may sound like the goody-goody version of letting loose, I’ve been having a lot of fun with how I nourish myself lately. Eating lunch in front of the TV…by myself! Cooking a meal just for me, that I will adore. “Abandoning” my family to walk home from the hockey arena on a warm day. By taking delight in these small moments through my day, I’m rejuvenating body and soul at a whole other level. I’m raising oxytocin levels, boosting motivation and charging creative energy in one fell swoop. Have I been so steeped in the model that that “useful” is the only acceptable daytime activity, that I’ve come to fear judgment from on high if I choose otherwise? In taking my need for pleasure out to play, letting a crack open in the veneer of perfection I think I need to maintain, I’m opening myself to the momentary freedom of not having to care what others think. Where the guilt I noticed the other day felt like hiding, instead I’ve created the space for my needs to step forward, step out, be seen – regardless of whether others find them acceptable. In opening up those needs, I take away the struggle and give them permission to be met. If that’s not healthy, I don’t know what is. So, tell me, which guilty pleasure is calling to you today? Tell us here – when you share in the comments, you open the possibilities for others – then go and fulfull it! …Then come back to let us know it felt! If you’d rather rather whisper this stuff quietly, join the WH community and share your secrets with us in the comfort of the closed Whole Health Dinner Party group. I’ll be in there later in the week to mull over more thoughts about guilt, pleasure and creating better habits. I’m talking about the energy-draining way your heart breaks when you have to fold your business, when you sell your house, when your period stops for good, or yes, when your man walks out on you (or you leave him). A breaking heart carries with it the heavy sadness that makes you want to curl into a ball, close your heart off from any more potential for hurt, and hide under a blanket for the foreseeable future. Yet, you’re expected to be happy about the changes in your life (sure some are indeed for the best), to let go and move on, to keep putting one foot in front of the other. I mean, aren’t we all about being healthy in our processes – doesn’t being healthy mean feeling good? The decades of twists & turns, ups & downs of my life have taught me differently. Circumstances like divorce, loss, injustices, as well as triumphs, opened me to the rainbow of emotions I hadn’t always understood before. Mainly, I hadn’t understood how they were connected to my health. I learned – through joy and sorrow, success and hardship – that allowing the flow of all my emotions is part of the quickest path to renewed health, inner strength, productivity, and to love…loving myself, that is. All that to say that even if you’re not bursting with thoughts of romance and crepe-paper hearts this week, that’s ok.
You’re feeling what you’re feeling and that’s not only ok, it’s necessary. When you give yourself the time and space to literally curl inward, sleep a few extra hours, watch too much TV and only talk to your journal, you are performing a beautiful act of self-love. If your daughter was heartbroken, you’d make her tea and let her cry on your shoulder – chances are that’s what you need as well. It’s extremely difficult to allow yourself that kind of wallowing; trust me, I know. When you’re the one who keeps everyone going, when you’re the one in control of the situation, it can seem nigh on impossible to fall apart. Perhaps you even harbour a fear that if you let go, you’ll sink into a rabbit hole of sadness and self-pity, even debilitating depression, and never find your way out. That won’t happen. Emotions are simply energy-in-motion. Given the freedom to move, they do what they have to do and subside, like a wave. The times I surrendered to the depths of how I was feeling, I’ve always bounced right back within a day or two, recharged and motivated to take whatever necessary steps were next. Sometimes you need to get to the bottom of the well before you can turn around and see the light. If your heart is breaking – scratch that, WHEN your heart is breaking, because it will break, there’s no getting around that in this life – be gentle with yourself. Listen deeply to what your body and your heart truly need in the moment and give it. Treat yourself with the loving care you would offer your best friend in the same situation. Make your favourite, creamy soup and eat it 3 meals a day. Spend the hours you need curled in bed pouring your sorrows into your journal. Call the one person who will listen without judgment or advice. Put on some heart-wrenching music; sing at the top of your lungs, dance in whatever way you’re your body wants to move, and let the tears flow when they come. If nothing else, breathe. Connect to the one certain thing in the moment and the rest will follow as it needs. Need help opening the doors to your heart again? Here’s a little ray of light you can let seep into the cracks and get things started. What nourishes you the most when your heart is breaking? When you share in the comments, you open the possibilities for others. Have a friend whose heart is breaking this Valentine’s Day? Pay the love forward by using any (or all!) of the pretty green buttons. People laugh at me sometimes, with how obsessed I am with book club. More than guiding my current reading habits and being an outlet for intellectual curiosity, it takes up priority space in my calendar. Some would say I’m almost religious about it. Could be. One thing I know for sure: that one night each month feeds my soul. I used to have a similar take on a choir I’d joined for a time. About the art school office I worked in for 10 years. About natural health school. About hanging with my friends – girls’ night dinner parties being the cherry on the cake. The common denominator in all these enriching scenarios? Female community. the permission to put myself first (not that we women need it, but we think we do). I learned that a strong group makes each individual woman stronger. Being immersed in a community of like-minded, supportive women is the most direct route to knowing and loving yourself. This solid container works for anything you want to improve really, however, in terms of health, the support of a group is proven to speed recovery and reduce risks of recurrence. As part of a community, you have a built-in buddy system – someone to hold you accountable, to cheer you on, to hold your hand when things get rough, and to celebrate with you when they go well. Knowing someone has your back in that way makes it easier to step out of your comfort zone. On my own, I doubt I’d have had the energy to find another man, let alone explore the world of online dating. Without the love of friends and colleagues, jumping full-tilt into a new line of study might not have been so effortless, and I may never have discovered a new career – one that continues to stretch and fulfill me 14 years later. A healthy relationship and enriching work serve to nourish you in mind and soul – essential pieces of your health picture. More than just having a body free of disease, health literally means to be whole. To have balance in the lifestyle choices you make, so you can enjoy balance in your life. That “being healthy” umbrella covers every part of your life – relationships, heart & soul, mind, work, money, society. It’s not just about the perfect body or a body free of disease. In fact (this is a discussion to explore further another day), it’s possible to be healthy even with a disease. Every part of your life stands to improve with the health-giving support of a collective. Community also means a place to ask questions and learn from the experience of others. In recent years, I’ve discovered pockets of loving circles online. Some of the small Facebook groups I belong to hold the same magic as I’ve experienced in person. They might be a network of colleagues and other alternative health practitioners; financial advice; business support for solopreneurs; accountability and cheerleading through a challenge or a course. I’m also a part of deep spiritual circles through the internet. I have connected with like-minded women all over the globe who I now consider good friends. No matter the area of life, my book club, my friends, these online groups all prove to me yet again that it takes a village to raise a healthy woman. Which is precisely why I have opened a community of my own. The Whole Health Dinner Party is a closed Facebook group for members of my community. It’s a place to talk about food and body and soul and life. For asking niggling questions and sharing thoughts. A place for conversation about health in all its shapes and forms. Won’t you join us? Enter your email in the box below and I will send your invitation. Your friends are welcome too! Invite them using any (or all!) of these sharing buttons.